Scenes at the end of my street Thursday 20:17. A roadblock and a crime scene investigation is underway. 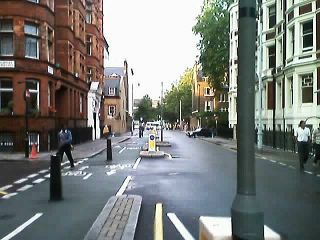 Just a couple of blocks over is Tavistock Place. The bus bombing outside the British Medical Association building was timed as the tube network was shutting down (the explosions were initially attributed to power surges) and people were turning to busses to complete the journey. Only two people have been confirmed killed on the bus, but unofficial reports suggest that the death toll will be much higher when they identify the remains in the surrounding area.